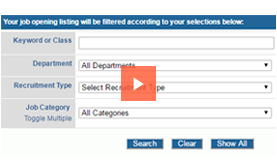 Step One: Review the job announcements posted at https://www.jobapscloud.com/sf/ and identify the jobs you want. Read the job announcement carefully-it tells you everything you need to know. Pay special attention to the "How to Apply" section and follow directions. You'll notice there are "permanent jobs," "temporary provisional jobs," and "exempt positions" listed on the job announcements page. The next steps you take depend on the type of position you're applying for. Temporary provisional and exempt positions don't require you to take a test, but those jobs are typically for a limited time period. Carefully read the job announcement to find out how long the job will last. You have to pass a test to get a permanent job. Step Two: If your application shows you are qualified for a permanent position you will be invited to take an exam. If you're applying for a temporary provisional or exempt position and your application shows you're qualified you will skip to step four. Step Three: If you pass the test for a permanent job, your name will be placed on what's called an eligible list, and you will be contacted by a department when a job is open. Step Four: You will then proceed with the hiring process as determined by the position and the department. Click on any of the following links below to view tutorials of the DHR online application process. Click on the Information About Hiring Process for an explanation of the meaning of a word. 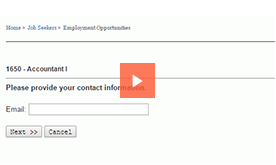 A video tutorial on how to search for a job with the City and County of San Francisco. Once you have finished searching for and identifying a position you're interested in, you may begin the application process. You can search the Job Descriptions table using the Search feature or Select Job Groups feature to narrow the list of Job Descriptions. 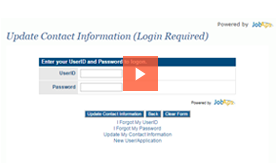 A video tutorial on how to update your contact information with the City and County of San Francisco. How to show you meet education requirements? How to verify education requirements and degree equivalency.